Our soldiers march in V-Day parade in China.. 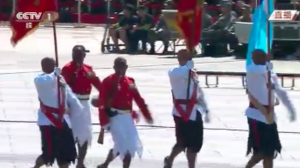 Seven Fijian soldiers have marched in China’s massive military parade in Beijing today. They were part of about one thousand foreign troops who took part in the V-Day parade. It showcases China’s weaponry and military might to mark the seventieth anniversary of Japan’s surrender in the Second World War. Fiji was among 17 foreign countries which sent troops to join the parade. Fijian soldiers continuously go to China for military training and this march was a way to reciprocate China’s support for Fiji than to march with them in the parade. ← Jarryd Hayne moves to trademark own name….